2016 Recap - Retirement Adventure Continues! 2016 Recap – The Retirement Adventure Continues! In truth, 2016 was an excellent year for Sarah and me, and over five years in my enthusiasm for the lifestyle I have built for my retirement only gets stronger. No, this lifestyle isn’t for everyone, but if you dream of releasing yourself from the shackles of convention, pushing your personal boundaries, fighting to overcome your fears and prejudices, seeing the world and living life as an adventure, I highly recommend that you take a look. 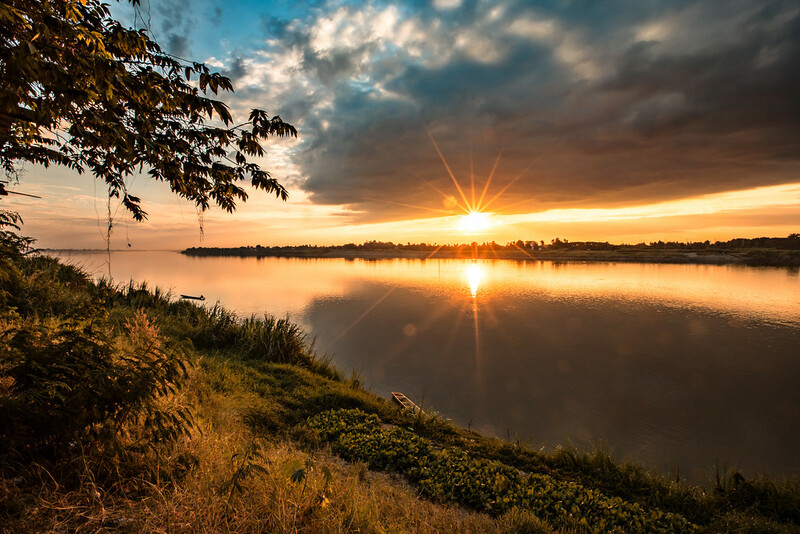 Sarah and I had been residing in Vientiane, Laos for about a year and we were beginning to discuss moving to a new home base somewhere out of Southeast Asia. We had grown to love Laos, had settled in well, and made many friends, but our house didn’t feel like a home. The place was nice enough, but it was too big, there were no views, and it was out of the city center. Almost everything we enjoyed doing required a commute of some sort. With our lease up, decision time was upon us. We knew exactly what we wanted for a house; modern construction, in a charming neighborhood with a mix of locals and expats, on the Mekong River, outdoor sitting areas, a garden for Biscuit (the cat) and Angel (the dog), and room for an office for me. Long story short, Sarah found a real estate broker who found us the perfect place that met all of the requirements. It was a bit more expensive than we had hoped, but we figured living in a home with views, in a neighborhood that we liked, with restaurants and shops within walking distance and comfortable outdoor living spaces, we would be saving money. Sitting here now, looking out of my office window at the activity on the river, I know we made the right decision. With the housing situation settled Sarah and I decided to kick back a bit and enjoy our new digs. It was fun getting into the rhythm of a new neighborhood. A typical day starts before sunrise with the sound of roosters and the chanting of local monks doing their morning alms rounds. We usually take breakfast and coffee on the upstairs balcony. Later, I work on my photos or writing projects for a few hours, before we decide whether to have lunch or dinner at a restaurant. 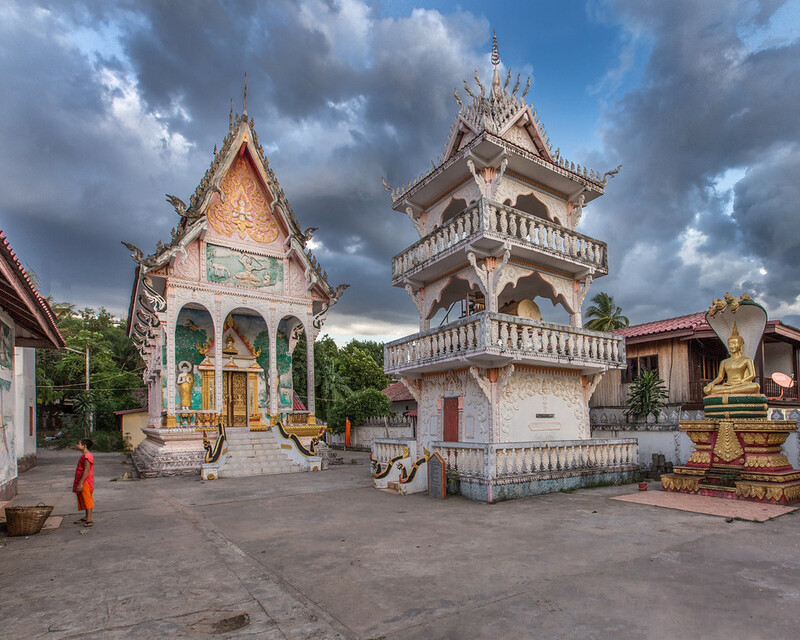 There are four neighborhood Buddhist temples, several simple restaurants – serving mostly noodles, satay, and beer – a local wet and dry market as well as banks, petrol stations, and convenience stores within a ten-minute walk. I don’t want to give the impression that our home is an enclave of western living forced into a Laotian community. 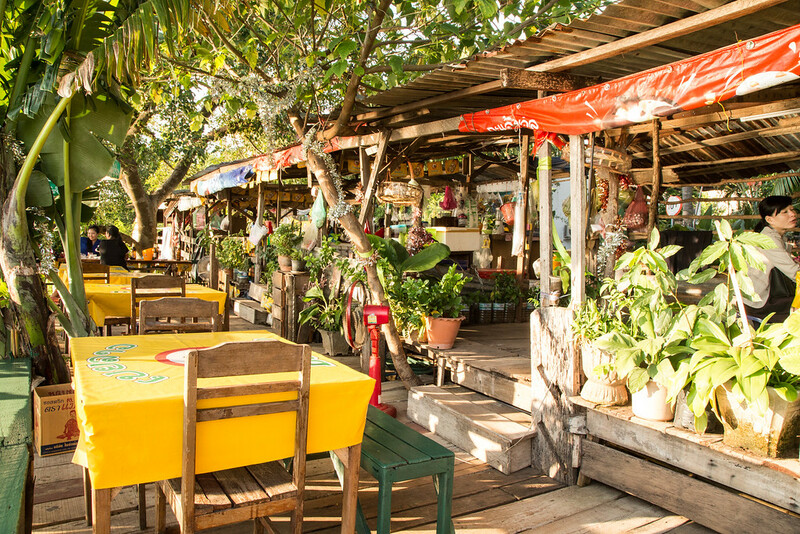 Yes, our house is modern, but the roads are dirt, the bars and eating places on the river are wooden shacks, and the locals still play boules on courts scratched out by hand on the side of the road. For some insane reason, several months back, Sarah and I had decided that we were going to raise money for one of our favorite charities, Action Aid, by running in the London Marathon, upcoming in April. With the event being less than two months away, our training distances were beginning to get lengthy. February in Southeast Asia is also the burning season, with the rice farmers burning their dry fields before the monsoons, and it is also one of the hottest months as well. Also, the roads in Laos, with all the stray dogs, potholes, and traffic, are not the best places to need to get up early at 5 AM to avoid the heat and run a casual 30 kilometers. We decided to find some housesitters and, imitating serious runners, go someplace conducive to training. We decided to go to Taiwan for a month. For 30 days we trained almost every day, circumnavigated the entire island by public transportation, ate some of the best sushi and sashimi I have ever had, watched the ocean, climbed mountains, and interacted with some of the kindest, most helpful people I have ever encountered. (People would help us buy tickets in train stations, store clerks would call English speaking friends on their phones to help interpret our needs and often a request for directions on the street was answered with, “follow me.”) We stayed in everything from simple country guesthouses, urban AirBnBs, luxury hotels and everything in between. We even managed to fit in two half-marathons in preparation for London. We spent the first few weeks of April in Vientiane putting the finishing touches on our marathon training. Okay, it was more like running around Laos sweating and swearing at ourselves for agreeing to do the run. If Taiwan gave us confidence, the springtime heat and smoke in Laos beat it out of us. We were excited, but we were also feeling a bit of dread about running 26.2 miles in the unpredictable London weather. 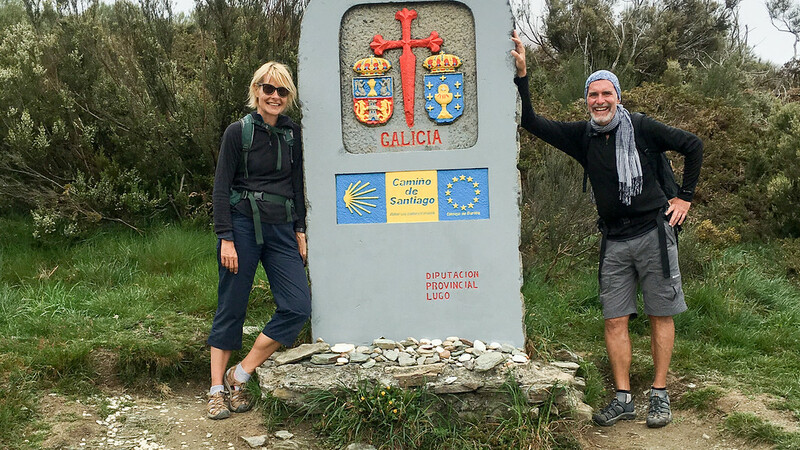 There was also something else on our minds that I have left out up until this point; two days after London we were to fly to France to celebrate Sarah’s birthday and then begin walking 750 kilometers across Spain on the Camino de Santiago. When we arrived into London the weather was pretty dismal; cold, rain, even a bit of sleet. The forecast on marathon morning was for snow. Sarah’s sister took us to a thrift shop, and we bought some sweatshirts to wear at the beginning of the race and then discard along the route. We had our running gear and bibs on under our coats for our commute on the train to Greenwich for the beginning of the race, but by the time we arrived at the starting pen, clouds were beginning to give way to blue skies and the temperature was moderating. I can’t say that we broke any records, but as Sarah says, “We didn’t come in last, and we didn’t get lost.” It was energizing hearing the crowds shout my name (“JON” was written in large letters across my shirt) as I struggled through the different London neighborhoods and it dragged me forward. It was fun running with the crowds around London’s most famous monuments and seeing friends and family along the way. It was a relief when we finally finished, tired, sore and moderately blistered, but we were only a few days into our six-week adventure. After meeting up with friends for a few pints and pub meals, and saying our goodbyes, it was time to fly to France. 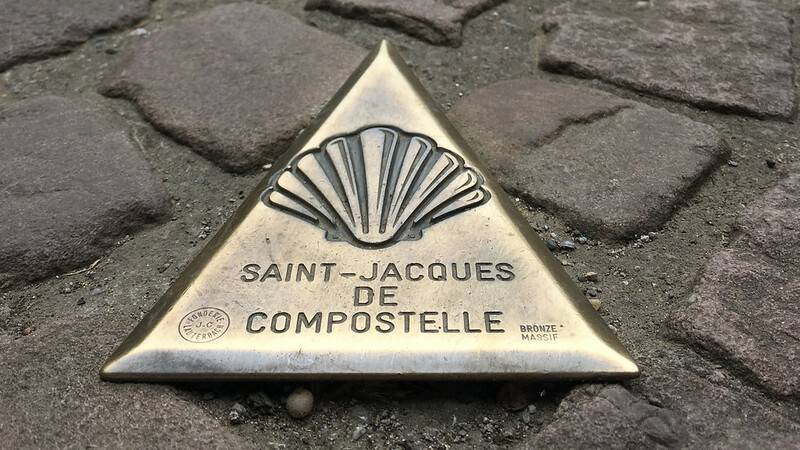 We allowed a few days for marathon recovery in Saint Jean Pied du Port, a quaint and historic little town that is one of the traditional starting points for the Camino de Santiago, but surprisingly, after just a bit of rest, we were well recovered. We celebrated Sarah’s birthday at a beautiful little restaurant with much wine and too much delicious, hearty, French food. I even decided to dust off some of my old French and try it out on the waiter. I didn’t get what I expected, but I never knew lamb pancreas and pimento could be so delicious. It may seem strange to say it out loud, but any journey, whether to the local grocery or across a whole country begins at the beginning. Sarah and I had breakfast at the little Bed and Breakfast we were staying in, put on our backpacks and started walking. We were of course very excited, but we also knew we had made the time to savor the experience. All we had to do was follow the arrows and enjoy the journey. I won’t go into too much detail here. There is a crudely written daily diary of our walk on the Camino de Santiago on LifePart2.com. We arrived back into Vientiane, the second week of June, just as rowing practice for the Dragon Boat races was beginning. Every evening competitors from our neighborhood would drag their long, skinny boats into the Mekong to practice their timing and strengthen their bodies. We got used to hearing the cadence coming from the river echoing through the house as the sun set over the river. Surprisingly their practice would sometimes carry on far into pitch blackness long after twilight had passed. June was also the month that I agreed to join the board of “Soap 4 Life,” a Laotian, hands-on humanitarian organization that empowers rural women by promoting hygiene and economic development by training them to make soap, as “Director of Communications and Public Affairs.” I believe in “Soap 4 Life” because it is a small, grassroots organization whose day to day operations are run by locals and permanent residents with a real stake in Laos. You can learn more about “Soap 4 Life,” here, here, and here. 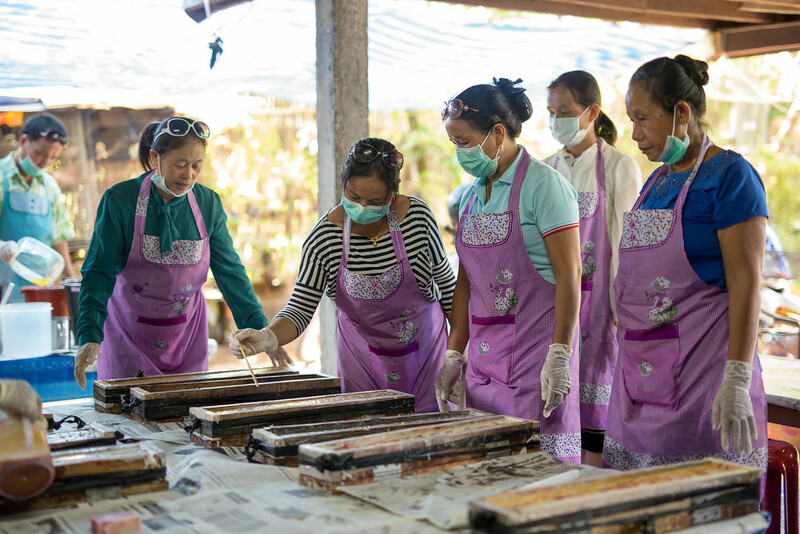 Women Taking a Soap Making Class from Soap 4 Life in Vientiane, Laos. We have been using Trusted Housesitters to find house/pet sits, as well as to find sitters for our furry friends. We have made good friends that way too. Sarah wrote a post about it a little while back. https://lifepart2.com/using-trusted-house-sitters-to-stay-for-free/ It has worked really well for us.